Bishop Ellis has since apologized. 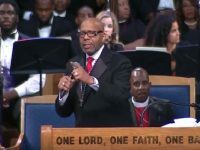 Bishop Charles H. Ellis III, the bishop who took official duty at Aretha Franklin's funeral, tendered an apology to Ariana Grande on August 31, on how he physically touched her while the two were on stage. The preacher made a verbal apology in his interview with a prominent media organization later in the day. Another apology was also given by Ellis for the joke the bishop made on the the singer’s name. Grande was groped by the Bishop Ellis after performing Franklin’s “(You Me Feel Like) A Natural Woman.” The photos showed the church leader touching Grande clearly at an inappropriate place, his fingers pressing a portion of her chest. In his interview, Ellis said he never intended to touch Grande's breast. He claimed not to know what he did when he put his arm around her. The bishop repeatedly apologized, saying he may have crossed the borderline of decency, and was too familiar or friendly with the singer. He then claimed to have hugged all performers during the eight-hour-long service, both females and males included. To bolster his claim, the bishop included the duties of the church in his explanation. He said that everything concerns love in his church. The bishop gave the interview in the cemetery where Franklin was finally interred. Ellis said it was not his intention to put up distractions during Franklin's funeral. 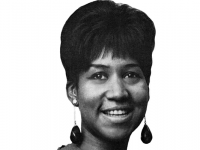 He wanted the event to be all about Aretha Franklin. To many observers and viewers, this was a lie. Several people posted magnified photographs of the moment and even tagged it in social media. The bishop made an apology not only to Grande but also to the Hispanic community and her fans for uttering a joke about her name. He said when he heard her name, he thought it was a new dish on the menu of the popular Mexican American fast food chain Taco Bell. In his excuse, Ellis said the only purpose of such a joke was to liven up the program by sprinkling a few jokes into the event. Ellis' touching controversy swamped earlier criticism of the short outfit Grande wore to give her performance. A number of people took to social media to post criticisms of the dress, saying it was too short for church. One social media user criticized those who spoke against the singer's short dress, saying that the latter has stayed silent on the harassment Grande suffered on the stage.